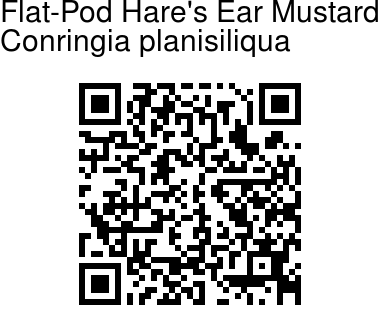 Flat-Pod Hare's Ear Mustard is an annual herb, 10-40 cm tall, erect rarely branched, hairless, glaucous. Leaves are oblong-ovate, thickish, hairless, somewhat glaucous, entire. Lower ones are obovate, shortly stalked or stalkless, obtuse, entire or sometimes obscurely toothed, 3-10 cm long, 1-3 cm broad. Upper leaves are usually oblong-ovate, stalkless, heart-shaped, stem-clasping, 2-9 cm long, 1-5 cm broad, often violet coloured. Flower-racemes are usually many flowered, corymb-like, up to 20 cm long in fruit. Flowers are small, about 5 mm across, pale yellow or whitish, often dark-veined. 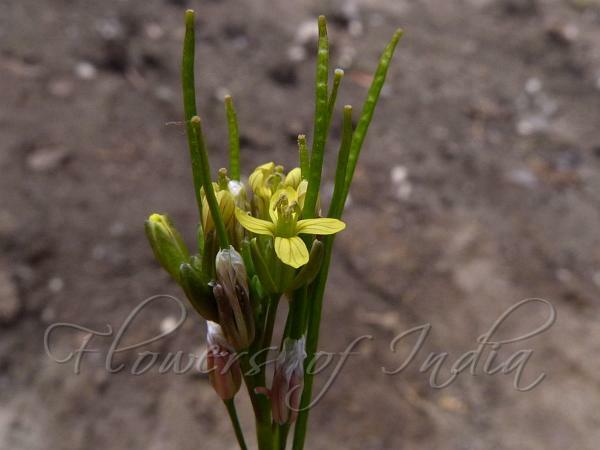 Flower-stalks are 5-10 mm long, increasing up to 1.5 cm in fruit, slender, not thickened. Sepals are 3.5-5 mm long, 1.2 mm broad, linear. Petals are 6-7 mm long, 1.5-2 mm broad, narrowly oblong, gradually narrowed towards the base, tip rounded or blunt. Stamens are about 4, 5 mm long; anthers about 1 mm long. Seed-pods are linear compressed, 4-7 cm long, 1.5-2 mm broad, erect, straight, torulose on the valves only, hairless, with an incomplete mid-vein on the valves (usually distinct in the lower portion). Seeds are 12-24 in each locule, about 1.5 mm long, oblong-ellipsoid, brown. Flat-Pod Hare's Ear Mustard is found in Afghanistan, Himalayas, Kashmir and Ladakh, Kazakhstan, Kyrgyzstan, Mongolia, Pakistan, Russia, Tajikistan, Turkmenistan, Uzbekistan and SW Asia, at altitudes of 300-3600 m. Flowering: April-June.